One of the perks of my Hollyhock hosting gig is, I get dinner. Dinner at the Hock is a big deal. It is gorgeous mostly-vegetarian fare: breads fresh from the oven, organic vegetables from the over-the-top garden. Sauces and spices and flower-topped salads tasting of earth and heaven, tempting to gluttony and abandon. Last night’s supper was directed by chef Rebekka whose cooking reflects her kindness to all beings. It wasn’t the perfect baked salmon with sorrel sauce or the braised beets or the fresh fruit pie with chocolate-basil whipped cream that did me in. It was the corn. 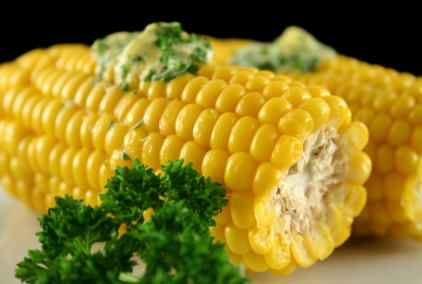 Fresh corn on the cob, just one boiled half-cob, with a salty maple-butter complement. I sheared off every kernel with my teeth and then discreetly sucked the sweet juice from the cut end of the cob. My mom would have broken the cob into bite-sized chunks and sucked on every chunk (with a little extra butter), but seeing as I was dining room Host, I didn’t do that. When I went back for seconds the corn was all gone. But oh, that corn-on-the-cob, that’s the stuff. I was raised with corn as religion. Farm-fresh corn, as per strict Mills family prescription, to be shucked within hours and plunged straight into the pot to boil for ten minutes NOT MORE and then eaten immediately, scalding hot, rolled in butter and salt. A pile of paper napkins and toothpicks on the side. Corn: that is dinner. What more could be needed? Life’s summers are too brief to be wasted on meat. When I live in the city food is cheap and abundant, Commercial Drive heaped with fresh produce local and exotic. I come home loaded with fat bags of cherries and peaches, avocados and melons, and a half-dozen cobs from the Okanagan farm truck parked out on the Drive. As soon as I am in the door I put the pot on the stove, and shuck the corn while the water comes to a boil. Sometimes I get fancy with a bit of pesto but otherwise it is just corn, with butter. There are no leftovers because while the summer lasts there is always more where that came from, fresh, and just a block away at less than a buck a cob. But ife on a small remote island is different. Last night’s corn-on-the-cob was likely my only corn for this summer, and so it was very special. There are no commercial farms here. If people have a bit of surplus they may sell it at the Friday market or the Food Co-op, but it is rare and it costs. Red peppers are $7.50 a pound at the height of summer. A cabbage costs an hour of my Hollyhock wages. Corn is heavy to transport, takes a lot of space to grow, and does not keep. Anyone on the island with a few precious rows saves that harvest for themselves, so fresh corn rarely makes it to market and when it does the price is high. Food here reflects the true cost of its transport and production. But I am hardly starving, even without Hollyhock treats. I live at Disney’s farm where I have potatoes, zucchinis, beets, chard, cucumbers, squash. Blackberries run rampant to adorn my cornmeal pancakes, topped with maple syrup gifted to me by Lise, from her family’s Quebec sugarbush. Rainbow-coloured eggs gathered with my own hands from under the warm bellies of the rainbow-coloured hensâ€”one of whom, appropriately, took a good bite out of my wrist in revenge. Scrambled, with red garden onion, peppers and tomatoes, every bite bursting with the flavour of gratitude. But corn-on-the-cob, oh corn-on-the-cob. So glad that I got mine this year.